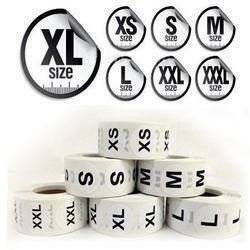 Manufacturer & Wholesaler of Garment Stickers. Our product range also comprises of Printed Label, Printer Machine and Barcode Labels. Reckoned in the industry as a manufacturer, supplier, trader, wholesaler and retailer, we are engaged in offering a wide range of Garment Stickers. Using qualitative raw material in the manufacturing process of these stickers, we aim to attain highest benchmarks of quality. To cater to the exact demands of customers, we provide these stickers in different sizes and shapes.